The Comics Fan: "Kingdom Come Special"
Up, up and away! A place for comic-book fans to gather. Small stack of comics this week from Bargain Comics. 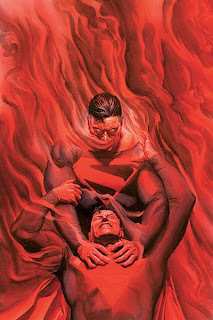 "Justice Society of American Kingdom Come Special: Superman" was a must for me because it features the art of Alex Ross. It's a treat to see his work on interiors as opposed to just covers. Ross also wrote the story - which I can't comment on because I haven't had time to really read it yet. I've only breezed through it to admire the art. The special ties into the Gog storyline in JSA which, I have to say, is really going on too long. "Detective Comics" No. 850 wraps up the "Heart of Hush" story. I still don't see how this whole thing has been a "Batman R.I.P" tie-in. There's a defining moment between Batman and Catwoman near the end that would be essential for all Bat-fans, except for the fact that it's washed away in the very next panel. You've been warned. I've been reading comics for as long as I could read. I write the Comics Fan, a column that runs every other Sunday in the Colorado Springs Gazette. "Rage of the Red Lanterns"